Regular readers (all three of you) of Neglected Cookbooks might recall a teeny tiny rant I had a couple of months ago about Jamie Oliver and his scotch eggs which ended with me threatening to throw said eggs at Mr Oliver whilst shouting “peel that mother******”. Just thinking about that night of quail egg peeling and the yolk carnage makes me want to vigorously deny what I am about to write, such is the anger that still simmers beneath the surface. However, I’m not a grudge holder and forgive easy, especially when presented with a big hunk of meat and a rich, savoury sauce. Jamie, I think I forgive you, although never darken my door with those quail scotch eggs of yours ever again else I may just to have to follow through on my threat. 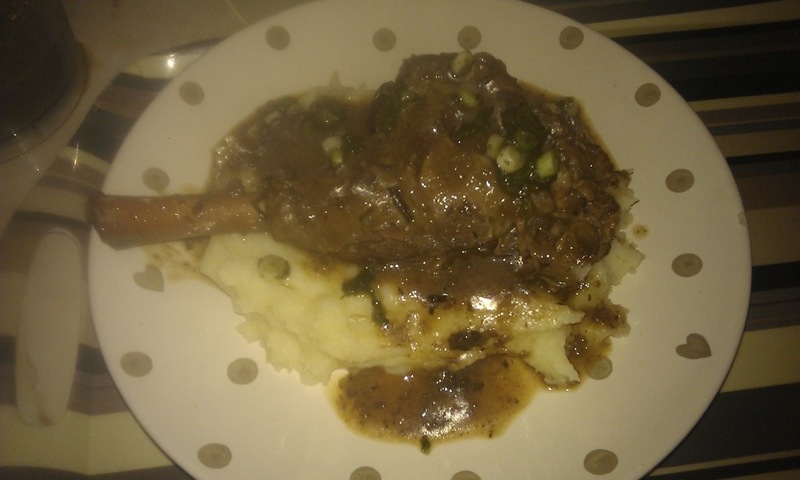 Wanting to cook some kind of lamb shank dish, I browsed though my cookbooks and deciding to give Jamie’s Great Britain another chance after the egg fiasco, cooked lamb shanks in a sticky Guinness sauce. Obviously I had to adjust the recipe slightly to suit my slow cooker, and while the sauce was impossible to reduce down in the slow cooker and wasn’t technically sticky, it still tasted handsome. I couldn’t caramelise the onions (which would lend the dish a sweeter, more concentrated onion flavour) but did manage to sear the shanks on the George Foreman to brown the lamb before chucking in the slow cooker. 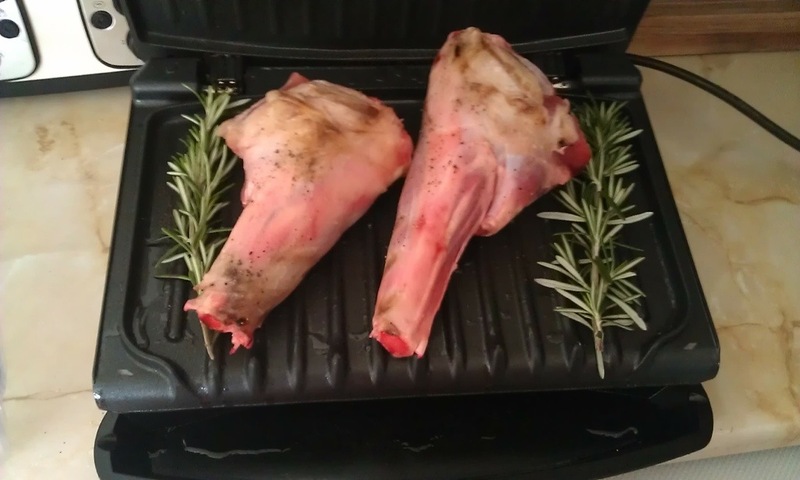 I don’t always do this with meat as cleaning the GF is a massive chore that I’d rather avoid, but seeing as lamb shanks aren’t the cheapest cut and I wanted to pack as much flavour as possible into the dish, it felt wrong not to go that extra mile this time around. This did mean though that I spent the rest of the day smelling like a roast dinner, which actually I kind of liked. My hair just smelt so edible! Another adjustment I made was reducing the amount of stock specified in the recipe as when cooking in a slow cooker the liquid doesn’t evaporate, meaning it takes a lot longer for sauces to thicken or reduce. If at all. Please bear this in mind when adjusting a recipe for your slow cooker. Once it’s all cooked, you blend the sauce so its a smooth gravy, bash up some mint dressing in a pestle & mortar and plonk it all on top of some mashed potato. It feels wrong to go to this effort and then chuck a ready meal mash in the microwave, but with my limited cooking equipment I had very little choice, and it really wasn’t that bad. The dish itself was very tasty and the perfect antidote to this miserable start to Spring. While the sauce was nowhere near sticky, it tasted gorgeous in its liquid form- rich, sweet and herby. If it tasted that good runny, I can’t imagine how much better it is as a thick, reduced sauce clinging to the meat. The lamb itself just fell off the bone and as you’d expect the mint dressing (made easily by bashing up mint leaves, olive oil, sea salt and spring onions) went perfectly with the whole meal. Meat in a rich, deep sauce is one of my favourite things to eat and it bugs me that I’m currently in no position whatsoever to make one. There’s a pub I know that does a gorgeous dish of venison in a red wine, bacon and shallot sauce, which tastes just as good as it sounds, and the sauce coats the meat perfectly. I need to go back. Once I’m in a position to I am definitely going to try and master the art of sauces, they can totally transform an average dish into an amazing one. This much I know, I will be making this dish again when I have a proper oven. Jamie Oliver, its official, consider yourself forgiven.